Nearly 30 years ago, Wayne Franits, now a professor of art history in the College of Arts and Sciences, arrived on the Syracuse campus fresh out of New York University with a Ph.D. in hand. Today, Franits is a world-renowned scholar, who has published dozens of articles and essays for international exhibition catalogs and written or edited seven books. An expert in 17th-century Dutch and Flemish art, Franits was just awarded a Franklin Research Grant from the American Philosophical Society (APS). 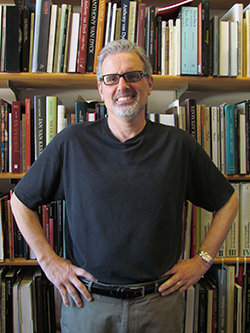 Thanks to the Franklin Research Grant, Franits, who joined the Department of Art and Music Histories in 1987, will spend part of the fall semester in London, where he’ll work on his latest project focusing on the late 17th-century Dutch painter, Godfried Schalcken. Franits’ research is being carried out in connection with two larger ventures, including an exhibition on the artist to open at the Wallraf-Richartz-Museum in Cologne, Germany, in the autumn of 2015 and a book-length study of Schalcken’s English years. This research grant is the latest in a long list of accomplishment for Franits, who has also served a lengthy term as chair of the art and music histories department. In 2005, Franits received a National Endowment for the Humanities Research Fellowship for a book on the paintings of Hendrick ter Brugghen. More recently, he also received a National Endowment for the Humanities Summer Stipend for a monographic study and catalog raisonné of the paintings of 17th-century Dutch master Dirck van Baburen. The APS promotes useful knowledge in the sciences and humanities through excellence in scholarly research, professional meetings, publications, library resources, and community outreach. The APS began awarding grants in 1933 to scholars in order to support the cost of research leading to publication in all areas of knowledge.